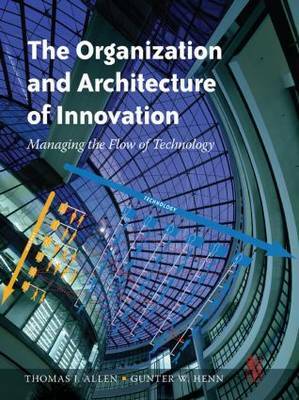 Building on his pioneering work on the management of technology and innovation in his first book, Managing the Flow of Technology, Thomas J. Allen of MIT has joined with award-winning German architect Gunter Henn of HENN Architekten to produce a book that explores the combined use of two management tools to make the innovation process most effective: organizational structure and physical space. They present research demonstrating how organizational structure and physical space each affect communication among people-in this case, engineers, scientists, and others in technical organizations-and they illustrate how organizations can transform both to increase the transfer of technical knowledge and maximize the "communication for inspiration" that is central to the innovation process. Allen and Henn illustrate their points with discussions of well-known buildings around the world, including Audi's corporate headquarters, Steelcase's corporate design center, and the Corning Glass Becker building, as well as several of Gunter Henn's own projects, including the Skoda automotive factory in the Czech Republic and the Faculty for Mechanical Engineering at the Technical University of Munich. Allen and Henn then demonstrate the principles developed in their work by discussing in detail one example in which organizational structure and physical space were combined successfully to promote innovation with impressive results: HENN Architekten's Project House for the BMW Group Research and Innovation Centre in Munich, cited by Business Week (April 24, 2006) in naming BMW one of the world's most innovative companies. Professor Thomas Allen is the originator of the Allen curve. In the late 1970s, Tom Allen undertook a project to determine how the distance between engineers' offices coincided with the level of regular technical communication between them. The results of that research, now known as the Allen Curve, revealed a distinct correlation between distance and frequency of communication (i.e. the more distance there is between people - 50 meters or more to be exact - the less they will communicate). This principle has been incorporated into forward-thinking commercial design ever since, in, for example, The Decker Engineering Building in New York, the Steelcase Corporate Development Center in Michigan, and BMW's Research Center in Germany.